It’s budget time. For the past couple of months, more frantically the past couple of weeks, leading up to February 29, 2016, an entourage of short-term-vision-money-men have occupied themselves with lemming-like enthusiasm to lobby the Prime Minister and the Finance Minister for favourable allocations that might deliver benefits to bump up next quarter profits, next fiscal year projections or next election prospects. The simplest of economic principles dictates, of course, that all resources being scarce, the choices we make will determine the success or failure of any developmental ambitions. Seen in this context, the mad scramble by businessmen of all descriptions to pocket favourable allotments ahead of competitors can be understood, if not forgiven. But an equally potent economic principle is at play, one that states that under-valuing assets (forests where tigers live, for instance), will result in such assets being eroded. This is the prism through which I see tiger conservation today. Fact 1: All global economic edifices, private or public, survive only because they are built on stable ecological foundations. Fact 2: India’s natural capital base (forests, wetlands, grasslands, lakes, mountains, corals, coasts and rivers) has been eroding faster than that of virtually every other large economy — a reality that the GDP calculators used by economists are not designed to understand or assess. Fact 3: The consequences of ignoring Fact 2 stare us in the face in the shape and form of climate-related (un)natural disasters such as the Chennai, Kedarnath, Kashmir and Mithi river floods and the equally devastating drought such as the one that Marathwada in Maharashtra currently faces. Fact 4: Climate change is a reality and there is neither enough money in all the banks in the world, nor any technology known to us that can more effectively bring carbon down from the atmosphere than through the resurrection of carbon-based biodiverse ecosystems that sustain and maintain our planet’s life-giving infrastructures of survival — air, water and land. Now, contemplate the fact that the very first step that Arun Jaitley, Finance Minister of India took after being appointed was to amputate the 2015-16 budget allocation for the Ministry of Environment, Forests and Climate Change (MoEFCC) by almost 25%, down to Rs 1,681.60 crore, ($244 million), even as the Prime Minister doubled the ministry’s workload by adding climate change to its portfolio. Within this misguided framework, Project Tiger’s miniscule budget was cut from Rs 161.46 crore to a laughable Rs 136.46 crore, representing a 15% reduction from 2014-15. But why save the tiger at all? You can only save the tiger (as metaphor) by saving its ecosystems. This ends up saving every plant and animal, large and small, which in turn helps to maintain and improve the ‘Garden of Eden’ that humans harvest. In the process, the tiger’s forests feed water into over 600 Indian rivers and, physically pull down (sequester) carbon from the atmosphere, which is stored safely. In other words, saving tigers saves us humans. At the many primary school interactions that Sanctuary Asia organises, we see children comprehending the above rationale and the fact that the tiger is a mere metaphor for all of nature. I wish we could say the same for the powerful ones who control large corporations, constituencies, often countries. This lot mistakenly assumes that saving tigers in captivity or in isolated handkerchief-sized, islanded forests adequately deals with the ‘tiger issue’, which they write off as emotional and not vital to our survival. When I look back over the past four decades of my involvement with the protection of Panthera tigris, one fact hits me square between the eyes — there are more tiger experts around today than wild tigers. Most such experts sit in the corridors of government, ignoring simple logic, credible concerns and sage advice, believing that their intuitive understanding of economics will save the day. Meanwhile they march resolutely forward towards pie-in-the-sky GDP targets that have no hope of being achieved because the ecological base they so easily take for granted is crumbling. It’s a tough one to answer, but I explain to them that nature has the capacity to heal itself, just the way a scratch or cut heals itself. If we allow nature to do its job without destabilising it, all will be well in the years and decades ahead. It’s a message of hope, for we have no right to burden children with despair, particularly since they can do little about it at this point in their lives. Frankly, I cannot even begin to imagine a world without tigers, but this is what my government is forcing me to contemplate today. And the tiger’s demise is but a precursor to the fate that stares us all in the face. That is the reality we must deal with. Across the world tigers went into sharp decline because of two primary reasons: One, they were hunted to death. Two, their forests were hacked down for timber, agriculture and industry. This would have been the fate of India as well had the late Prime Minister Indira Gandhi not intervened in the early 1970s, in response to national and global appeals to save our tigers. Project Tiger was launched in 1973. Leading from the front, Kailash Sankhala, the first director, supported by a veritable army of credible individuals and NGOs, prevailed upon our government to set aside vast parcels of land for nine tiger reserves in representative habitats, where nature would be left to its own devices. “Do nothing and let next to nothing be done apart from protection, and nature will do the rest as forests naturally regenerate. That’s all the tiger needs from us,” said Sankhala. In principle, the same policies continue to guide the National Tiger Conservation Authority (NTCA) today. But a clutch of politicians have been systematically diluting Project Tiger’s armour in the most lethal of ways by financing the destruction of forests for dams, mines, roads and other urban infrastructure. Also, by systematically hacking the protection budget of the NTCA, which today houses Project Tiger. This has resulted in budget cuts for anti-poaching, forest-fire-fighting, staff salaries, and village relocation. Unbelievably, the money saved by externalizing the cost of public health, education and environmental protection is being pumped into such ill-fated plans as the construction of high dams in the Himalaya where Rs 500,000 crore are to be invested on new dams whose water sources, the glaciers are receding. Comparable amounts are being contemplated for a river-linking project involving dams and canals whose displacement and ecological impacts will dwarf even those of China’s infamous Three Gorges Dam. 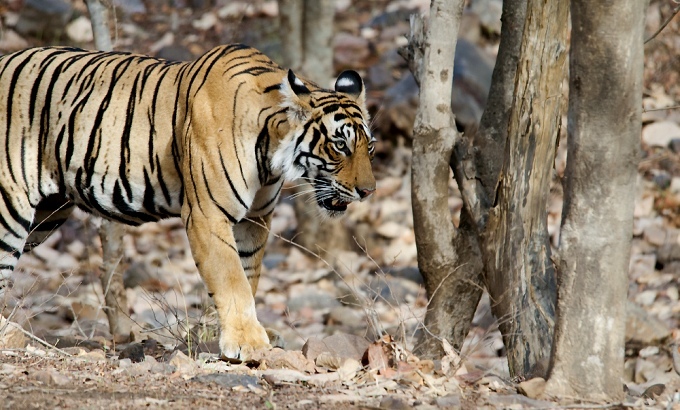 Project Tiger forests require dramatically enhanced budgets. If our government’s ecological misadventures continue, we will see an accelerated frequency and intensity of rogue climatic events that will make a mockery of India’s economic and social claims and ambitions. This would be bad for the economy, bad for our food, water and social security, and certainly bad for tigers. Politicians and Bureaucrats are two sides of the same coin. Economists as mute spectators don’t speak on climate change and its effects that affect the future generations…..including their own. Sad.